In ProofHub you can set your email preferences, language, timezone and other settings like chat and notification sounds etc. 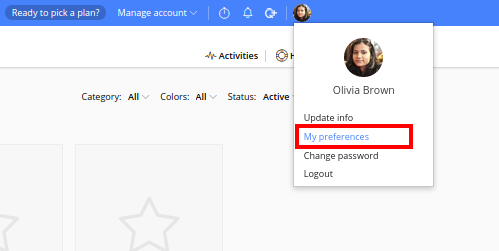 Using email preferences you can select if you shouldn’t or should be notified and when should you be notified, about activities within ProofHub. Go to the top right corner and roll the cursor over your profile pic. Click the My Preferences link. Select the appropriate option to how often you want to receive the notification emails. From here you can also set preferences of project progress report(for managers). 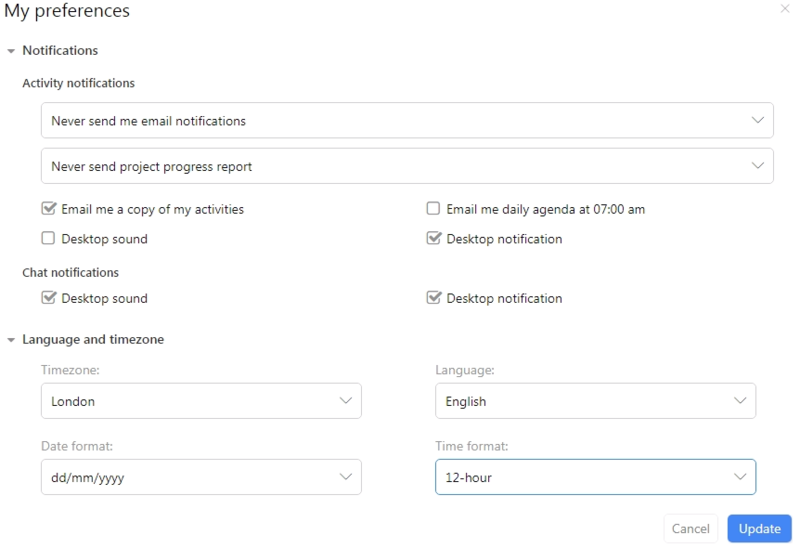 Daily agenda email, desktop notifications and notifications can be turned on/off from here. You can also set the time and date format as per your personal preference. When a person is assigned as a manager of the project, he can enable project progress reports. Select the frequency at which you want to receive the the progress report. 1. This option is only available for those who are assigned as the manger. 2. If a manager is not assigned, the creator of the project will get the email notifications of project’s progress report. You can get the daily update of the tasks that you have scheduled for today. Users will get the daily agenda mail at 7 AM daily as per their timezone. You can select the agenda mail check box to get daily update of tasks. If you have this option enabled you will receive notifications of the activities done by you. Be it any comment posted on discussion or task completed by you. You can enable/disable chat and desktop notifications for yourself from here. You can set your regional timezone and language from here.